The excitement and celebrations of the last two months or so has calmed. It has felt like I have been on a hamster wheel ever since my husband’s 40th birthday in late July. The busyness came to a crescendo with the twin’s third birthday two weeks ago. And now it feels like things are settling to normal levels of chaos. For a couple of weeks anyway. But one thing for sure is that spring is in the air and more importantly, strawberries are EVERYWHERE. If you are living in Australia you are probably lucky enough to be able to grab a punnet of strawberries for one dollar. And they are goooood. Sweet and juicy. Just perfect. 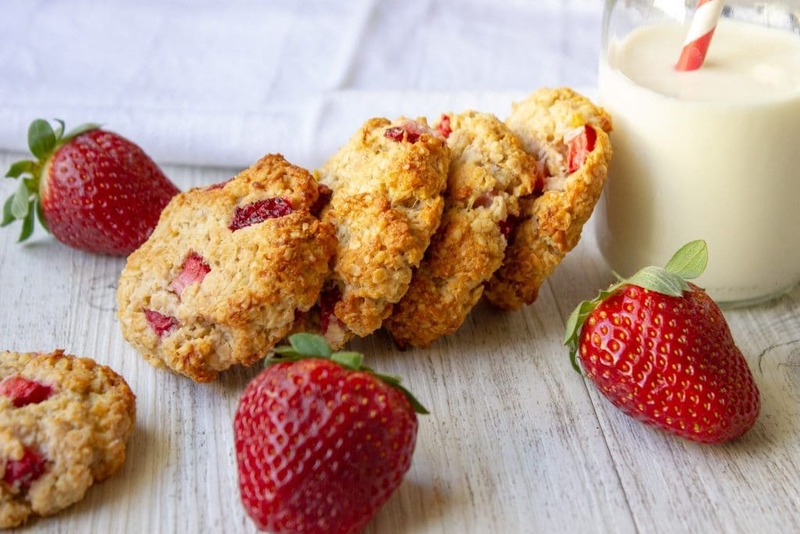 And the perfect excuse to make these delicious Strawberry Coconut Cookies that are free from added sugars and only sweetened with fruit. Now I am going to put it out there – there are a few tips for baking these Strawberry Coconut Cookies. These cookies have a tendency to get little dry due to the coconut so to avoid this, take care with measuring the dry ingredients. Ensure that the dry ingredients are loosely measured, you do not need packed cups. Also, make sure you are using a large overripe banana (measuring around 200g). So if you do not have bananas that big, you may need two bananas. 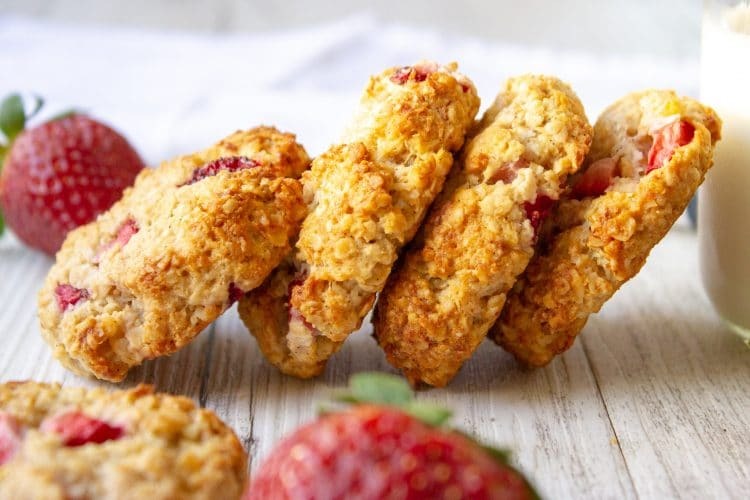 Using an overripe banana will ensure the cookie is sweet enough as there is no added sugar in these Strawberry Coconut Cookies other than the naturally occurring sugars in the ingredients. These cookies are not overly sweet, they have a subtlety to them that I like. And I love the fresh strawberries in them.I have recently been working on more recipes that are sweetened only with fruit and do not have added sugar. Have you tried my delicious Apple Oat Cookies or my Carrot Cake Muffins yet? They are really yummy and I love giving my kids a healthier baking option. 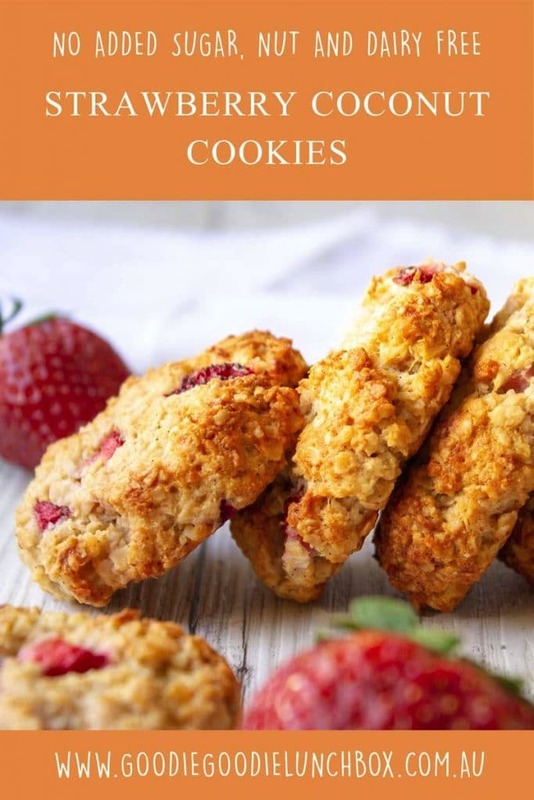 These delicious Strawberry Coconut Cookies are sweetened only with fruit and they are a healthier option for school lunch boxes or snacks. 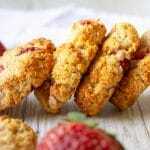 Nut and dairy free these Strawberry Coconut Cookies are also great for baby led weaning. Spoon generous tablespoons of the mix and with wet hands shape the dough into cookies or with two spoons shape each portion of the mixture into cookies. The mix will be quite sticky. Bake the cookies for around 12 – 14 minutes or until they lightly golden and the mixture bounces back when touched lightly. 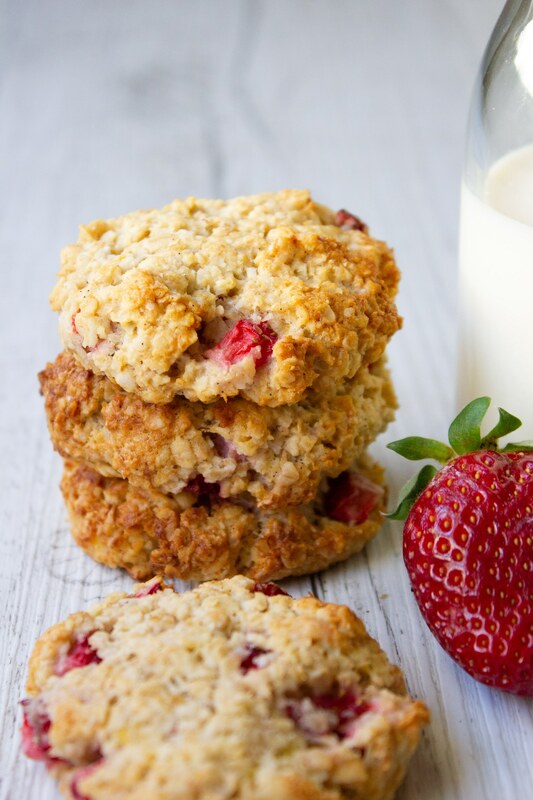 I hope you enjoy these Strawberry Coconut Cookies! If you do bake these, please share them with me on Instagram or Facebook! Are quick oats the same as instant oats? The coconut milk, is it the thick kind or the one we use to replace cow’s milk? In Belgium we call them both coconut milk. This recipe looks great. Can’t wait to try it. How long would these keep in the fridge for? Especially being that the strawbs are fresh. I haven’t actually tried but probably just regular milk would be ok. Happy baking! Hi, How Can I substitute the wholemeal flour, so it can be gluten free? Just wondering is the flour plain or self raising? Can I use vanilla extract rather than vanilla paste? Delicious and not too sweet, perfect for my daughters lunchbox!